The Market is open tomorrow from 9 am – 1 pm (and the first and third Saturday of every month). We have ample car parking, disabled access and hot food/drinks available from the cafe. We’re delighted to have a new stall ‘We are desserts’ joining this time called who will be bringing a selection of delicious sweet treats! Sorry, no dogs except guide dogs! 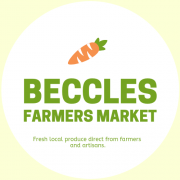 Any questions please contact Beccles Farmers Market on Facebook or drop us an email at becclesfarmersmarket@gmail.com.